Affordable, temporary storage for incidental spill control. SpillPals are the most affordable, convenient temporary storage available on the market today. 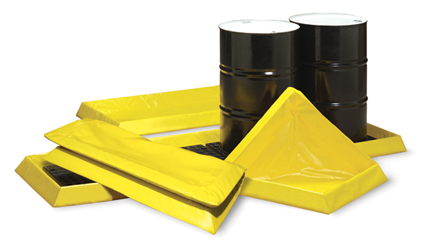 Provides incidental spill control during temporary storage of drums, machine parts, tanks, generators. Can also be used as a wash down pad or pumping station. Features 4" flexible foam sidewalls that spring back to form allowing easy drive in and out of hand trucks and forklifts. Reusable! Fold up and store on a shelf when not in use, freeing up valuable floor space.